Local honey for allergies: Pollen in honey cannot desensitize the immune system. Why eating local honey won’t cure your allergies. Even if honey were chock-full of pollen, it would offer no protection against allergies—because the pollen in honey is the wrong kind of pollen. They stagger into Andrew Murphy’s office itchy, sneezing, and watery-eyed. This, in itself, is unremarkable. As an allergist in Pennsylvania, Murphy regularly treats patients suffering from seasonal allergies. But when Murphy starts to explain to these patients the standard options for treatment—oral anti-histamines, nasal steroids, or immunotherapy—they want none of it. Instead, they want to know about an all-natural remedy they’ve heard touted by friends or on the Internet: local honey. The logic goes like this: During an allergic reaction, your body’s defenses overreact in response to an allergen, causing you to swell and tear up and sneeze. For many, that allergen is pollen. And bees, as we all know, use pollen to make honey. By exposing yourself to a low dose of the very thing you’re allergic to, you’re helping your body develop a tolerance and stop freaking out every time you’re exposed to it. Sweet deal, right? Except for one thing: That scenario is totally, utterly wrong. First of all, bees do not make honey from pollen. Bees make honey from nectar. Yes, pollen gets stuck to their legs in the process, which is how they pollinate the next flower they land on. But when it comes to the actual honey-making, pollen is but an “accidental guest” to the party. “The amount of pollen in honey is minuscule and not enough to impact the nutrient value”—around 0.1 to 0.4 percent, according to the National Honey Board. (Raw honey might contain slightly more pollen than processed honey. It also might contain bee parts, venom, bacteria, and mold.) That’s certainly not enough pollen to make honey a miracle cure. But there’s a better reason the home-remediers are wrong. Even if honey were chock-full of pollen, it would offer no protection against allergies—because the pollen in honey is the wrong kind of pollen. We know, we know—your allergies come out in March or April, when daffodils shoot up and the cherry blossoms are in bloom. So it’s tempting to believe that those beautiful devils must be the cause of all your suffering. But actually, the pollen in flowering plants is generally too large and sticky to trigger your allergic reactions. A “vanishingly small” number of people are actually allergic to the pollen made by “pretty plants,” says Mitchell Grayson, an associate professor of allergy and immunology at the Medical College of Wisconsin. Flower pollen can occasionally cause problems for florists, who work in close contact with an abundance of flowers and are always breathing them in. But for most of us, flowers are not the problem. Instead, virtually all seasonal allergies are caused by trees, grasses, and weeds. Those plants make pollen that is small, windborne, and gets all up in your nasal passages. One whiff and your body goes haywire, producing the runny nose, watery eyes, and itchiness you know and hate so well. The terms “rose fever” for summer allergies and “hay fever” for autumn are also both misnomers. Because roses bloom in summer, and hay gets tilled in the autumn, people assume those are the plants causing their allergies, says Murphy, who is also a member of the board of the American Academy of Allergy, Asthma, and Immunology. Really, they’re scapegoats. In these seasons too, the culprit is really just the pollen that comes from your standard old trees and grasses. 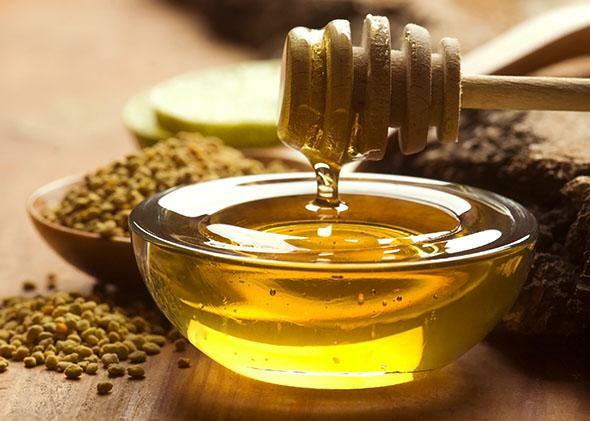 Heard people say that after a month of eating honey, their symptoms subsided? That’s not because of the honey—it’s because they’ve managed to outlast the pollinating season of whichever trees and grasses they’re most allergic to. Immunotherapy isn’t necessarily a bad idea—it does seem to be possible to desensitize your body to the kind of pollen you’re actually allergic to. Large, randomized studies have shown that, for grass pollen allergy, giving patients pills laced with pollen can moderately decrease their symptoms and improve their quality of life. But the line between allergic reaction and desensitization is precarious. “The key is dose,” says Murphy. That’s why he selects immunotherapy patients carefully, and monitors them after their first dose in case they have a severe reaction. With honey, there’s no way of monitoring the dose. This creates a Catch-22: Most likely, the amount of pollen in any honey you eat will be too small to do anything. But if you’re that sensitive, it’s possible you could have a full-blown allergic reaction instead of reaping the positive effects of immunotherapy. “Your immune system is exquisitely sensitive, so a low dose of something you’re allergic to may be enough to cause a problem, but not enough to desensitize,” says Murphy. Still, as far as natural fixes go, it’s one of the least dangerous and certainly the tastiest. So while Murphy would never recommend honey as an allergy cure—“I just don’t think there’s going to be a lot of help from using it,” he says—he also wouldn’t go so far as to forbid his patients from slathering some on their toast. “I’ll try to educate them, but if somebody really wants to do it, they’re going to do what they want to do,” he says. Just try not to hold your breath that it’ll help you breathe, and you’re golden. Why Do Allergies Get So Bad in Your 30s?